Scroll for information on VanEs Camp and Conference Center, the Canadian Moravian Mission Society, the Canadian Moravian Historical Society and the Canadian Moravian Foundation. 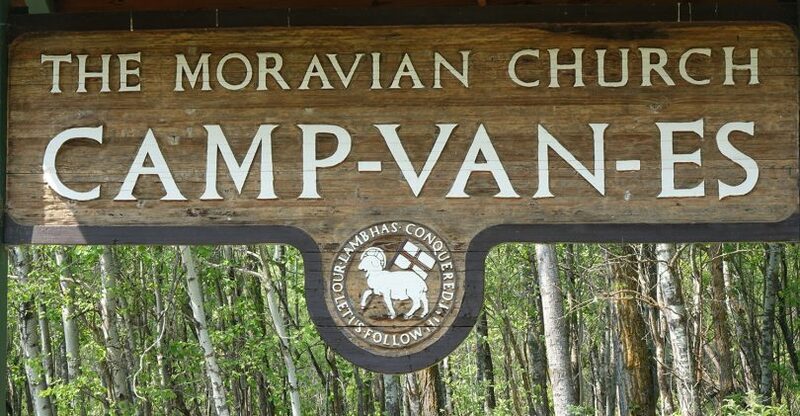 Founded in 1940, Camp Van Es has been an important part of the ministry of the Moravian Church in Canada. Located on 100 acres of secluded wooded land on the shores of South Cooking Lake near Edmonton, the facility offers a perfect setting not only for camps, but also for weddings, family gatherings, business conferences and retreats. With its miles of nature trails, banquet facilities, auditorium, swimming pool, hot tub, gymnasium, rustic cabins and comfortable modern lodge, the site can host up to 200 people year round. You only have to walk in the historical Van Es Chapel once to get the spirit of this enchanted resort. Whether you are looking for a place to revitalize your team, or sit quietly around the campfire to renew your spirit, Van Es Camp and Conference Center will certainly let you experience moments you will never forget. The Canadian Moravian Mission Society (CMMS) provides support and encouragement to congregations and individuals wishing to respond to the needs of God’s people through local and global service and mission. It operates under the Board of Elders of the Canadian District (BECD) with a mandate to provide overall direction for mission as well as stewardship of district mission funds. The CMMS consists of a standing committee that includes one representative from each congregation and a chair who is elected at synod. The chair reports to the BECD, and maintains a liaison with Board of World Mission (BWM) as the elected representative of the Canadian District. The CMMS is sustained through donations as well as an annual synod-mandated stipend from the BECD. It supports the needs of emerging Moravian ministries and long standing mission partners as they are brought forward by the BWM. To learn more about these missions and ministries, visit www.moravianmission.org. The Rajpur Foster Child Project operates under the CMMS and was developed in the Canadian District to provide tuition plus room and board at the Moravian Institute in Rajpur, Northern India for disadvantaged and orphaned children so that they may receive a quality education in a loving Christian environment. To make a donation or learn more about Rajpur, visit www.rajpur.ca or contact: [email protected]. To donate to the CMMS or learn more about our work, please contact Donna Gordon at [email protected]. You can also learn more with our updated brochure (download). The Canadian Moravian Historical Society collects, examines, preserves, and interprets historical material which is used to publish and disseminate the story of the Moravian Church in western Canada, and its contribution to the Canadian history and culture. Established in 1982, the Canadian Moravian Historical Society is an independent, not-for-profit registered organization with a volunteer board of directors. Since its inception, the Society has published several books related to the Moravian Church history. In addition, the Society publishes the Canadian Moravian Historical Magazine on a annual basis. The magazine was first issued in May 1995, and includes a wide variety of subjects by many authors, all of which cover some aspect of church history. On behalf of the Board of Elders of the Canadian District, the Society is also responsible for operation of the Canadian Moravian Archives. The Archives contain records pertaining to church activity across the Canadian District, along with extensive material from Reverend Clement Hoyler, the founding pastor of the first Moravian congregations in western Canada. The Canadian Moravian Historical Society is sustained through membership fees, fundraising, donations and an annual synod-mandated stipend from the Board of Elders of the Canadian District. For more information about membership, or special programs and presentations about Moravian Church history, contact [email protected]. For historical information, contact the archivist at [email protected]. View Canadian Historical Society Magazine archive here. The Canadian Moravian Foundation was established in 1978 as a registered charity to provide an easy way for members and friends to support the work of the Moravian Church in Canada. The affairs of the Canadian Moravian Foundation are managed by a Board of Directors whose members are appointed by the Board of Elders Canadian District. Over the years, the Foundation has received donations that are held in a permanent endowment. The income generated is used to support our ministry and outreach in Canada. In fact, the Canadian Moravian Foundation has distributed more than $125,000 in grants since 2000. Please continue to give generously to help us spread the good news here at home, and around the world!